Once again, it seems that your humble editor’s words are worthy enough to be reproduced outside the friendly confines of MICRO-FILM and C-U Blogfidential, and it took some folks from the Hoosier State to help make it happen. Hitting the newsstands about a month ago, the new issue of Sirens of Cinema magazine (vol.2 no.6) from RAK Media Group, Inc., of Indiana, features my profile of British-born actress Fiona Horsey, whose work finally reached the United States last year in the MTI Home Video releases ANGST and TWISTED SISTERS. Currently playing a nun in a telenovela while living with extended family in Bogota, Columbia, Miss Horsey has raised eyebrows amongst the horror/underground crowd with her gutsy portrayals in the aforementioned films. Thanks to publisher Robert Kupier and editor Mike Watt (the stage-blood-slingin’ Mike Watt, not the econo-jammin’ Mike Watt) for accepting me into the fold, meaning that my prior SoC article (see item: 6/24/06) wasn’t a one-shot deal. Whew. Hitting the video shelves about a month from now will be RETURN IN RED, a psychological thriller-science fiction hybrid from Indianapolis-based Innerworld Pictures that I have covered in the last three issues of MICRO-FILM. 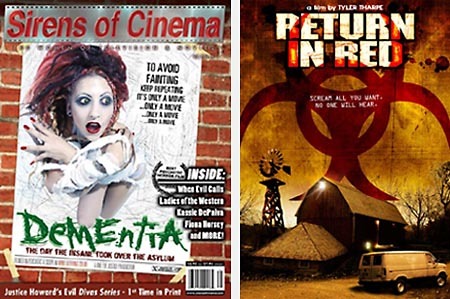 Thanks to director Tyler Tharpe, the DVD release from Image Entertainment will feature those very articles as an extra! I wanted dearly to draft a wrap-up piece for the disc so that viewers weren’t left hanging, but I guess we’ll all have to read about it in the next MICRO-FILM instead, won’t we? Start saving your pennies for the occasion. Finally, for those who might wonder whether I am capable of writing anything without the words “movie,” “cinema,” “independent,” or “film” in it, look no further than my MySpace page, The Land of JaPan. (The anecdote about being carded while attempting to purchase APOCALYPSE NOW notwithstanding…) I’ve never consistently kept a diary or journal in my life, and I once thought that I’d merely ignore the blog feature of MySpace, yet I’ve actually posted 15 times “over there” so far. Wonders never cease. This entry was posted on Friday, January 12th, 2007 at 2:27 am	and is filed under JP Confidential, MICRO-FILM du C-U. You can follow any responses to this entry through the RSS 2.0 feed. Both comments and pings are currently closed.